That means start kissing German green jobs good bye. Yet another Soviet-style propped up industry begins to bite the dust. According to co2-handel.de here, rising raw material prices on the purchasing side, falling prices on the sales side, falling market demand, and reduced subsidies are spelling big trouble for the once booming German solar industry. Solarworld, based in Bonn, did better than most other German solar companies. For the first 6 months of 2011 it recorded a profit of €22.4 million, but that was down significantly from €34.8 million for the same period last year. Half-year sales plummeted 12% to €535 million. Konstanz-based Sunways AG’s 2nd quarter sales collapsed from €64.6 million to €38.7 million during the first half of this year, posting a loss of €2.5 million euros. Things were even worse for Conergy. According to CO2-handel.de, the Hamburg-based company lost €41 million in the first 6 months of this year compared to a profit of €5 million for the same period last year. Bavaria-based Phoenix Solar extended its losing streak, posting a loss of €21.1 million compared to a loss of €18.7 million for the same period last year. Sales plummeted 61% to €140.8 million. Asian manufacturers are now flooding markets with cheap modules. 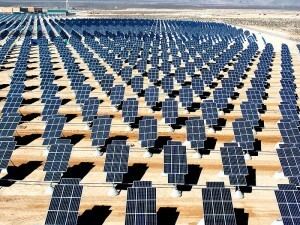 Solarworld director Frank Asbeck expects 8 gigawatts of over-capacity from Asia. The flood of red ink is occuring despite government subsidies, which however have been scaled back this year. Face it without the still generous subsidies, the figures would be much worse. And despite the low-priced cells coming from Asia, it’s still a lousy way to produce energy – especially in gray and rainy Germany. State ans US take it in the shorts for about $80 million in grants. $450 million plant will be scrapped because it is too specialized to be converted to other uses. Germany needs to get in line with all of the other nations that have squandered billions in renewable energy. A few days ago i found an article saying that prices are down 20% for modules compared to last year and that the total amount of Watts sold in 2011 will probably be 20% up compared to 2010; so the total money spend on installing new capacity stays roughly constant globally. This is about what i have expected. Subsidies aside, PV continues to get more cost efficient following an exponential curve. Looks like the only exports of a “Green” economy are jobs. The Chinese can’t make money with solar either. Remember the “High Tech” Chinese panels in Spain that landed on the scrap yard? A good business is a business that makes a profit without any Government grands. Take it from me that solar isn’t a business. Ron, the Chinese have long since improved their quality. They use German machinery by Roth&Rau and Centrotherm. The quality is practically identical to German made modules; it’s a standardized product now. They sell half of their output to Germany; Germany pays 1.20 EUR per Wattpeak, the Chinese Government takes the Euros and gives an according number of Yuan to the Chinese company that produced them. That’s how the government amasses Dollars and Euros and keeps the price of the Yuan under control – they give you MORE Yuan for your Euro or Dollar than the free market would. They simply print them. Even at 1.2 euro’s a wattpeak cell this isn’t real watts anyway. Mass output solar cells are only 9 -15% efficient. The lab produced ones are only up to 22% consistent efficient. That’s if the array is clean – and the sun is shining at maximum. The price is for a Watt-peak – the efficiency only influences the area that you need. The theoretical max efficiency for single junction solar cells is 33%; modern mass produced cells are slightly below 20% ATM but rising. Multi junction PV cells in research labs have reached 41%. Too complicated/expensive for the mass market for the time being, though. I was talking about silicon PV; thin film (CdTe) cells are in the 9-14% range. The price per Watt-peak for thin film is traditionally lower than for Silicon but the gap has been narrowing in recent times; today it is the cost of the land that decides whether you go for thin film (which needs more area) or silicon (where you need less area but pay slightly more for a Watt-peak).